It’s the little sibling of popular Cafe Lago in Montlake and is both an Italian grocer and deli. Do not miss the meatball pizza. Cafe Lago has been an Italian favorite in Montlake since 1990. Fresh-made pasta, pizzas baked by apple-wood fire, that beloved lasagna. Now, just a short distance away sits its younger sibling: Little Lago, an Italian grocer and deli. Step into the small space near Portage Bay and wander the short aisles full of select Italian goods. Find pastas, sauces, well-priced wines, cheeses and more to bring home and make a feast. Or, step through the door and head straight to the right, where you’ll find several small tables with cute red chairs. There you can enjoy treats from the deli — baked goods, salads, one of many Jones Sodas on offer from the fountain — chat with neighbors or watch the big-screen TV. The menu: The store is open all day, but the deli’s menu shifts throughout. Start the day with a lox bagel or Uova in Purgatorio, a baked egg dish, or some pastries and an espresso. Beginning at noon, sandwiches (many served on the ever-exquisite Sea Wolf Bakery’s breads) and pizzas take over the menu. Choose between a deluxe grilled cheese with Brie and house-made tomato jam, or a spicy Italian sandwich with sausage and peppers. Pizzas are Italian-style, of course, with a crispy thin crust and a nice, smokey flavor. Vegetarian white pizzas are great options, or go red with meatballs or sausage and pepperoni. For dinner, sandwiches are out and calzones are in. And after 4 p.m., stop in for rotisserie chickens (half chicken $8, whole $13) and ribs (half rack $10, whole $17), a great option to take to-go. 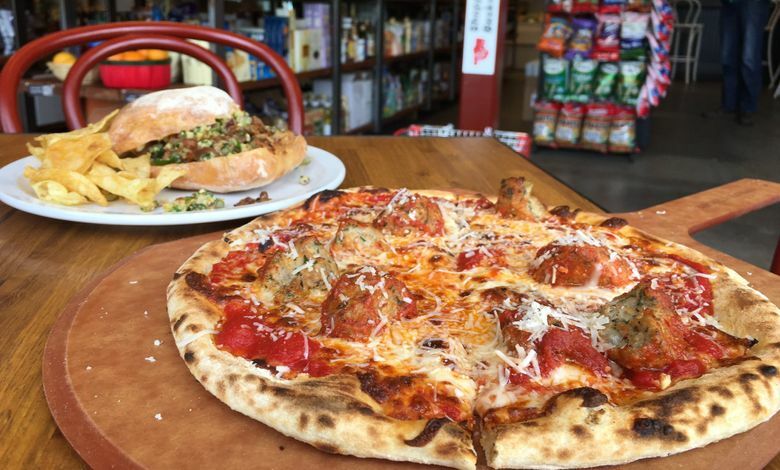 Don’t miss: The meatball pizza is worth stopping in for. The house-made meatballs are light and flavorful and are well-paired with a smoked mozzarella and bright tomato sauce. The crust remains perfectly crispy, and not for lack of heavy toppings. Add a simple arugula salad, and you have a light meal for two. What to skip: The porchetta sandwich comes with a hazelnut gremolata with a powerful fennel flavor that overshadowed the meat. The crunchiness of the nuts, though, was a nice touch, and there’s no going wrong with a Sea Wolf ciabatta. Prices: A meatball pizza ($13), porchetta sandwich ($12), arugula salad ($5), half roasted chicken ($8) and a side of potatoes and kale ($3) totaled $41, before tax and tip.